Studio/Run time: Focus Features, 96 mins. The title of the new film from the Coen brothers instructs us to “burn after reading,” but that won't be necessary. The whole thing vanishes in a puff of sauna steam the second the credits begin to roll. Speed RacerThe story feels like Blood Simple transplanted from rural Texas to Washington, DC. Joel and Ethan Coen have replaced the drawling juke-joint employees of their debut feature with CIA agents and personal trainers, but the characters are involved in the same sort of overly complicated schemes that are concocted to squeeze money out of people. Of course, they end up squeezing blood instead. employee (George Clooney) who is also sleeping with McDormand's character. The script chases its tail for an hour and a half and then conks out, tired and strangely satisfied with its catch. There is an old TV commercial for a synthetic, bacon-shaped dog snack in which someone's pet would leap excitedly at the site of the box. "Dog's don't know it's not bacon!" said the ad's bemused voice. The Coens treat their human characters the same way, but making adults circle around a worthless CD-ROM found on the floor of a fitness center requires an accumulation of stupidity. And even if our expectations have shrunk enough to fit into the groove of a brewing fiasco, we still expect a funny climax. 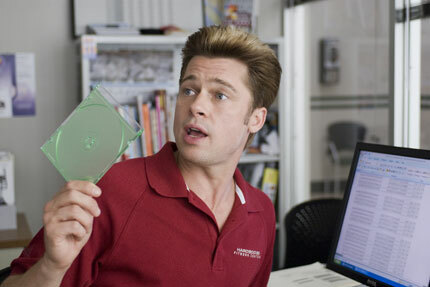 In Burn After Reading, it never arrives. are acting like they're in a Monty Python sketch. They're playing quirks instead of characters: Pitt bounces in his car like he just stepped out of an exercise video, McDormand mispronounces "drivel" as "dribble," and Clooney perpetually twitches and blinks. In the Coens hierarchy of intelligence, Pitt's character sarcastically makes fun of everybody else even as the Coens are making fun of him. The pointlessness of the whole project makes you wonder if the Coens, conscious of how hard it would be to follow their flawed but provocative Oscar winner, No Country for Old Men, decided to write one in their sleep. Or maybe they found an unfinished screenplay on the floor of their gym, produced it with A-list actors, and figured out how to squeeze money from all of us.